Ready to quit clonazepam for good? First, be safe! PRESENTING A COMPREHENSIVE GUIDE TO CLONAZEPAM WITHDRAWAL. Here, we outline what withdrawal feels like, how long it lasts, and how you can manage it both safely and effectively. Do you feel stuck? Are you nervous about what can happen when you quit clonazepam? You are not alone! People are ready to quit benzodiazepines like clonazepam every day. Deep down you may really want to quit for good. However, withdrawal symptoms such as nausea and anxiety can pop up whenever you attempt to stop. And these symptoms can drive you right back to taking clonazepam again. Withdrawal symptoms manifest when your brain and body have become drug-dependent on a medication and need it to function normally. But, there are ways to make the transition from drug-dependent to drug-free. You can do this slowly and safely, especially with specific guidance and professional medical help. Here, we’ll review what withdrawal is and how you can safely come off clonzaepam. Continue reading to learn more about clonazepam withdrawal, its symptoms, side effects, duration, and ways to manage it. At the end, we invite your questions. In fact, we’ll try to respond personally and promptly to all real life situations. We understand what you are going through! Clonazepam withdrawal is a cluster of physical and psychological symptoms that occur when you are physically dependent on clonazepam and stop regular dosing of clonazepam suddenly. Changes in dosing include significantly lowering doses or missing a dose completely. Q: Is withdrawal the same for everyone? The symptoms of clonazepam withdrawal and their severity are different for each person. They may be harsh and uncomfortable for some, or moderate, flu-like symptoms for others. In all honesty, clonazepam withdrawal can be challenging…especially if you’ve been taking it for a prolonged period of time (over 3-4 consecutive weeks) or abusing it by taking more or more frequently than prescribed. You may have even attempted to quit clonazepam before, but were unable to succeed due to the severity of these symptoms. The problem is that once the effect of the drug wear off, withdrawal starts…and a quick solution for resolving the pain is to take clonazepam again. How can you get out of this cycle and quit for good? Is clonazepam withdrawal too much for you to tackle alone? Clonazepam is a psychoactive drug that works by changing brain function. In fact, clonazepam reduces the excess electrical brain activity related to feelings of anxiety and panic. However, regular use can lead to chemical changes in the brain when you use it or abuse it for any length or time. Chemical dependence is one such expected outcome of regular use of clonazepam. What is dependence in easy-to-understand terms? As parts of the brain are regularly suppressed by clonazepam, the central nervous system adjusts to the chemical interactions caused by the drug. It “re-balances” its own chemistry to accommodate the foreign chemicals. In this way, clonazepam leads to physical adaptations. Your body becomes accustomed to the constant presence of the drug, and without it, you feel ill. In order to get back to a brain-body balance in the pre-clonazepam state, you will first need to go through a formal detox process. During detox, withdrawal symptoms manifest until the brain reaches homeostasis…and the body becomes accustomed to functioning without clonazepam. Q: What happens when you stop clonazepam after brain and body changes have taken place? A: Your body experiences a state of ‘shock’ until time helps you regain balance. This is actually a natural and expected response; the functions that were being suppressed are suddenly not, and a kind of “rebound” occurs. As your brain and body struggle to regain normal function, the temporary chemical imbalance manifests as withdrawal symptoms. Your brain and body can regain homeostasis function without needing clonazepam to ‘feel normal’. We can help you get there. Call us at 1-877-706-2159 for more information. Clonazepam dependence and addiction are closely related, but they are two different states. Although you have great chances of being dependent on the drug if you have developed an addiction, not all cases of dependence develop into addiction. You are DEPENDENT ON CLONAZEPAM when you take it for medical reasons and as part of treatment. You are also likely to experience withdrawal…but you may never develop addictive behaviors. Dependence comes from a physical need for the drug and is an expected and natural adaptation mechanism. You may be ADDICTED TO CLONAZEPAM when you feel a compulsive need for the drug. People going through addiction have lost control over drug use, and continue use despite negative effects on health, relationship, and finances. Addiction is characterized by the psychological need for a drug. It is considered a primary, chronic, neurobiologic disease that requires a set of pharmacological and therapeutic interventions to be managed. Continued use of clonazepam despite harmful consequences. Impaired control over amount and frequency of use. Increase in clonazepam doses without consultation of a doctor. Using multiple sources (often illegal) to get clonazepam. Recognize any of these signs of addiction in yourself or a loved one? For help locating addiction treatment programs, call our FREE and Confidential hotline as soon as possible. Trained addiction recovery specialists understand what you are going through and can answer any questions you might have about getting the help that you need. The fact is that clonazepam withdrawal can be severe and unpleasant. But, there are quality detox programs that employ medically trained staff who can make your withdrawal process as smooth and comfortable as possible. You only need to call us to put an end to your suffering. The amount of clonazepam that you typically use (the higher amounts you use – the longer and more severe withdrawal effects you will experience). The length of time you were using clonazepam on a regular basis (taking it for longer periods of time may lead to more severe withdrawal symptoms and longer withdrawals). The route of administration (Did you take it orally, inject it, or snort it?). Whether you take other drugs and alcohol, as well. Your individual, unique metabolism and psychological constitution. EARLY WITHDRAWAL 2-4 days after the last dose. This is the period of days it usually takes for withdrawal to occur. Early symptoms you can expect to feel usually include anxiety, panic attacks, restlessness, and stomach problems. PEAK OF WITHDRAWAL 7-14 days after the last dose. This is the period during which symptoms reach their peak in intensity. Effects may include tremor, insomnia, and diarrhea. LATE WITHDRAWAL 14- 28 days after the last dose. Medically managed symptoms begin to subside. However, withdrawal may worsen if not managed appropriately and lead to hallucinations, agitation, and seizures. PAWS 2-4 months or even years after the last dose. Also called Post Acute Withdrawal Syndrome, PAWS consists of mostly psychological symptoms that can linger for several months, with some people reporting them for as long as 6 months. How To Withdraw From Clonazepam Safely? 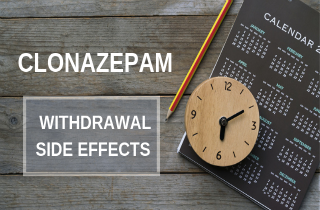 The best and safest way to withdraw from a benzodiazepine like clonazeapm is via medical treatment, including a withdrawal management program supervised by doctors and nurses. Withdrawal is not an easy process, and it may result in serious complications such as hallucinations or seizures. This is why close, 24-7 medical supervision is advised during the course of acute clonazepam detox. 1. TAPERING – Dose titration is one of the most common strategies for withdrawal management from clonazepam. Always seek the help and advise of a prescribing physician who can design a tapering schedule for you. Doctors can also prescribe medications or suggest over-the-counter meds for short-term management of symptoms. As you reduce doses gradually, you are slowly weaning yourself off the drug over a period of weeks until you can finally stop clonazepam completely. This process allows your body to adapt to lower and lower doses of the drug without experiencing an abrupt and violent reaction. 2. MEDICAL DETOX – The safest way to quit clonazepam is to enroll into a detox facility during the acute phase of withdrawal, when you come off the drug 100%. Medical detox ensures that trained professionals are on hand to monitor and assist you 24 hours a day, 7 days a week. During a medical detox, medical teams can offer pharmacological as well as moral support to get you through the riskiest withdrawal stages. What’s the first step to a safe withdrawal? There is no specific medication currently approved to treat withdrawal from benzodiazepines like clonazepam. However, there are several medications that may be useful during medical detox. Antidepressants can help manage depression and suicidal behaviors. Anticonvulsant medications (such as Tegretol or carbamazepine) can be used in cases of complicated seizures. Selective serotonin reuptake inhibitors or SSRIs (Paxil and Prozac) may be useful in addressing some of the symptoms of withdrawal. You can also ask your doctor or a pharmacist at the local pharmacy for suggestions on short-term over-the-counter medications that can help relieve specific symptoms. In addition to pharmacotherapies, your doctor may refer you to relapse prevention groups, support groups, and/or an addiction treatment facility. You can also CALL 1-877-706-2159 to get in touch with trusted treatment consultants who can provide you with everything you need to know about clonazepam withdrawal, addiction, and treatment options. It is important that once detox is complete, you have a plan in place to lower chances of relapse. Relapse is likely to occur in the first couple of hours and weeks of any detox process. Can I Cold Turkey Off Of Clonazepam? It’s never a good idea to go cold turkey off clonazepam. The withdrawal symptoms can be very dangerous (tremors, hallucinations, seizures) if you cease use suddenly. Plus, it may easily lead to a relapse. Without the support of medical and psychological interventions, quitting on your own may do little to address the issues that led to the drug abuse – resulting in a relapse when these issues resurface. Another risk of quitting clonazepam cold turkey is the emotional distress that you are likely to experience. Mental health complications may also lead to risk for harm due to accidents, poor judgment, or even suicidal behaviors. There are numerous reasons that can lead a person to start abusing clonazepam. Some start taking it recreationally to experience a “high”, others find it helpful in dealing with difficult and stressful moments in their lives… but it all leads to one place: tied in the chains of clonazepam addiction, afraid to stop, afraid of going through withdrawal. BUT, there is a way out! YOU can beat your inner battle by not going through the process of withdrawal alone. There are people who can help you with the struggles you are facing. CALL NOW. STEP #1 – Break out of denial. First, it’s time to face the consequences of drug use. Then, look around and see that your loved ones, family members, and close friends are also impacted by your state. Then, admit to yourself that you have a clonazepam problem…Only then you can start to change your life for the better. STEP #2 – Educate yourself. Read, research, ask around, watch testimonials online, get a hold of all the information you can about clonazepam withdrawal. This will help you get prepared for what you can expect when withdrawal starts. STEP #3 – Find the best rehab for you. For some people, withdrawal is just the first stage of the rehab process. Clonazepam dependency and addiction can be difficult to overcome and you may benefit from undergoing professional substance use disorder treatment that includes professional therapy, social support, and long-term aftercare to significantly reduce the risk of relapse. REMEMBER: Recovery is possible! Over 23 million people walk tall in addiction recovery. If they do it, so can YOU! Call our helpline TODAY to look into your withdrawal and addiction treatment options. Overcome the fear of clonazepam withdrawal. Achieve a new, substance-free future. Get back on track with your life. Go through the detox process in safe conditions and with constant care. The most important thing is that these programs teach? How to discover who you are without clonazepam. Is clonazepam getting in the way of the life you want? Calls are confidential, and available 24 hours a day, 7 days a week. I don’t take these regularly. Maybe once in two weeks, sometimes twice in a week. The last time I took 2mg was 3 days ago. I am shaky, feel irritable, trying not to dwell so I don’t induce a panic attack, which I never had in my life before using this drug. Her advice was to take more for a panic attack which would put me back in the same cycle of withdrawals again. My health is good, no factors that would make it worse. Besides being pissed off she gave me this and didn’t tell me a thing about it, right now I just feel like crap, flu., muscle spasms I took 2mg on 2/11 and had just gotten over, what I now know was withdrawal symptoms like the flu, muscle spasms, stomach pains, temperature rise, shaky hands, tremors, and no sleep. Had I known about all of this, I would not have taken the 2mg on the 2/18. Hi Diane M. Some people get dependent faster than others. Again, there are many factors at play. Also, it might not be withdrawal, but side effects from the pill itself. Talk with your doctor, taper slowly and get rid of this medicine. Doctors can probably find another alternative that doesn’t produce his side effects. Thanks for that reply! I went to detox to get this awful drug out of my system. I am on day 21 after detox and feeling much relief but still having shakiness sometimes as it leaves my system. Hydrating, exercise makes it leave quickly so I am doing what I should. Since the drug was addicted to me and me, not to the drug, I am having no problems with cravings as I never want to see this drug again!! I found a natural sleep aid through Melatonin, 30 mg works perfectly and no side effects! Also, anxiety can be naturally relieved by taking magnesium supplements, magnesium glycinate. Honestly, I never suffered from anxiety or panic attacks until I was on this drug. With it being prescribed willy nilly, I can see where our country’s opiod and benzo problems came from, Doctors!! I have been prescribed clonazepam for sleep but I don’t take it every day. I take 2 pills at night when I have had days of no sleep. I find out today from my doctor that all of my symptoms are because of this drug. I had no idea that taking two pills in one week would send me into a panic attack, no sleep, etc. I hate that my doctor gave me this instead of a sleeping pill which I ask for every time and she suggests something else that has terrible side effects. Since I do not take this drug regularly, am I going to go through terrible withdrawals, more than feeling like crap, tired, insomnia, the runs, headache in my temple? Hi Diane M. How terrible the symptoms will be depends on factors like length and amount of use, general health, genes and use of other medications. Talk with your doctor, or find another one to get a second opinion. I took this medication for 5 weeks and had no idea that I would suffer with withdrawal from this medication . I have not taken it for over a week and feel terrible, I had some anxiety and stress that I have been dealing with and it helped but I had no intention of staying on this medication and did not no that in that short of time I would be experience this. Every article I read about this medication alludes to the fact that one is an addict or misusing this drug. I have never misused and was only taking 0.5 prescribed twice daily but I only to two at night to sleep. I am really upset that my doctor would prescribe this type of medication without at least warning me of how addictive this drug is. How much longer will I be feeling like this? I have a life and things I like to do but have not been able to because of how badly I been feeling. I got to get out the house and I have been in the house for over a week. What Can I do to ease this and will withdrawal stop soon? I need help what should I do. Hi Karen. Clonazepam withdrawal can be extremely unpleasant. That is why I suggest you seek medical help. That is the safest option where you will be monitored by medical staff during detox. Please feel free to call us if you need any advice on the treatment options available. How long is withdrawal between each small those reduction? I am reducing by 1/4 mg at a time. Does the entire dosage reduction timeline occur between each reduction? I took Clonazapam for almost 10 years then had to wean myself off after The State of Wisconsin mandated that people stop taking it. It has been over 2 months of hell with the symptoms waning but then coming back even stronger. If I wasn’t retired, I would have certainly lost my job because most days I can’t function. I have had all of the symptoms that you listed as well as a deafening ringing and whistling in my ears. I’ve had panic attacks that sent me to the emergency room on two occasions. I tapered off from 2 to 1.5 to 1 to .5 to .25 to taking a little bite off of a quarter of a tablet over 4 months before stopping. After getting a prescription in September, I was told that I would have to wean myself off, so I did with no further assistance from that doctor. I feel sorry for anyone who has to stop taking this medication and still has to function in the world. I lost 25# and still have no appetite. The panic attacks are the worst thing that I can imagine. My other doctors can’t believe that I’m having the problems that I am this long after quitting, but I am. how much does it cost for your help ? Hi Larry. If you need to discuss about your treatment options, I suggest that you call the helpline you see n the website to get in touch with a trusted treatment consultant who can help you find the best rehab for you.